Vegging out at the weekend! 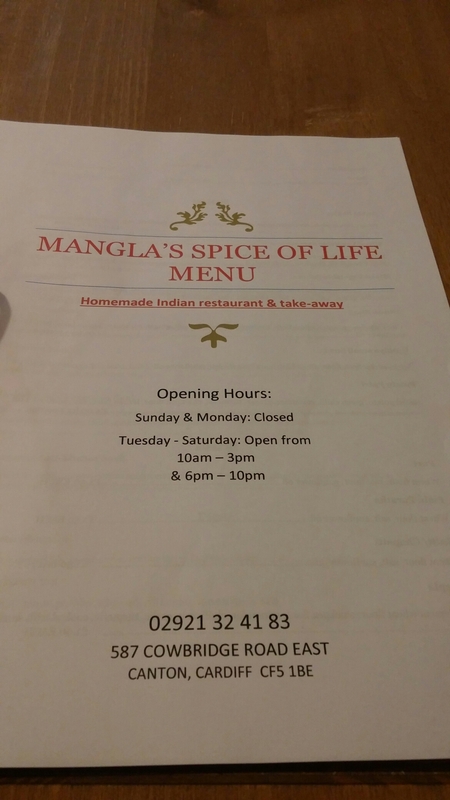 Mangla’s Spice of Life, Victoria Park, Cardiff. I am often accused by Mrs. SF of simply vegging out on the sofa at the weekends. It is a charge that is hard to deny, as after a long week in work I quite often can’t be arsed to do much on the weekends bar from walking the dogs, cracking open a bottle of wine and nodding off in front of the box (glass, rather than me, usually half drunk). All very rock and roll I know!!! The vegging out in the post title, however, relates to eating (rather than sleeping), something I am rather partial to at the weekends and indeed the week). In this instance it was, a rarity for me, vegetarian food. 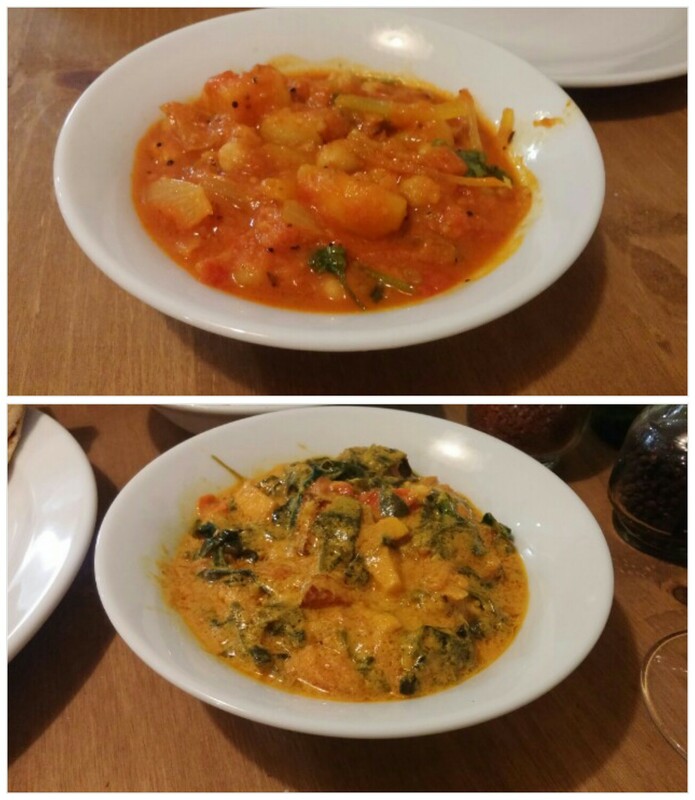 Opposite Victoria Park, Mangla’s Spice of Life is a vegetarian restaurant that draws on the chef patron’s Gujarati heritage in term of menu content. Regular readers will know I am much more a carnivore than a herbivore, but I am quite partial to the vegetable heavy cuisines of various parts of the Indian Subcontinent. The vegetarian diet in Gujarat (a state in the West of India abutting Pakistan) is heavily linked to the Jain religion. Jainism in its most extreme form takes vegetarianism to quite amazing levels, with even root vegetables (such as, those staples of Indian cuisine, onions and garlic) frowned upon due to the risk of damaging microbes in the soil as they are uprooted. Thankfully Mangla’s style of cooking does not take its vegetarian theme to such extremes, with onions, garlic and tubers much in evidence. 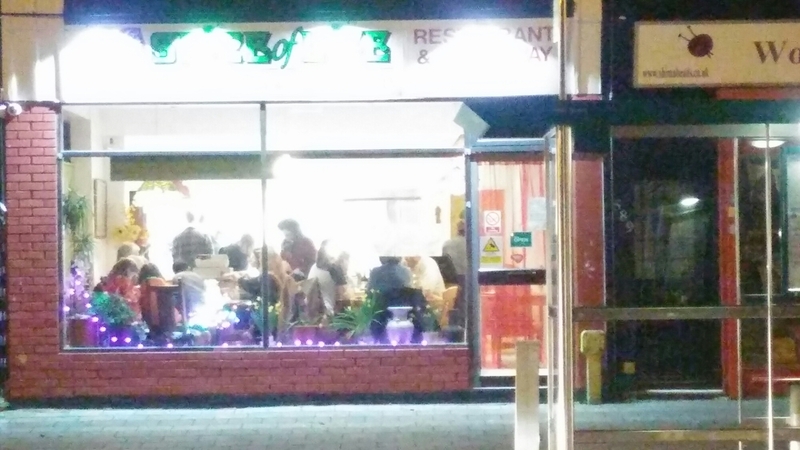 Mangla’s Spice of Life has a rather lovely back story with the owner fulfilling a life long dream of running a restaurant dishing up Gujarati food. I don’t know what it is about the food industry, but it seems to attract happy people or make for very happy people (think Dusty Knuckle, Charcutier Ltd, Pettigrew, Early Bird Bakery, Mr Croquewich and Hangfire to name but a few). It makes me rather jealous. Some days I enjoy my job, other days I hate it. Most days it exercises the brain and pays the bills. If I, however, have to work on the weekend what I most certainly don’t do is wake up on a Saturday morning and think “Oooh work today – yippie”. These people I strongly suspect do – if they ever have an actual day off! Mangla is someone who seems to have truly found her calling and boy is she happy doing it. 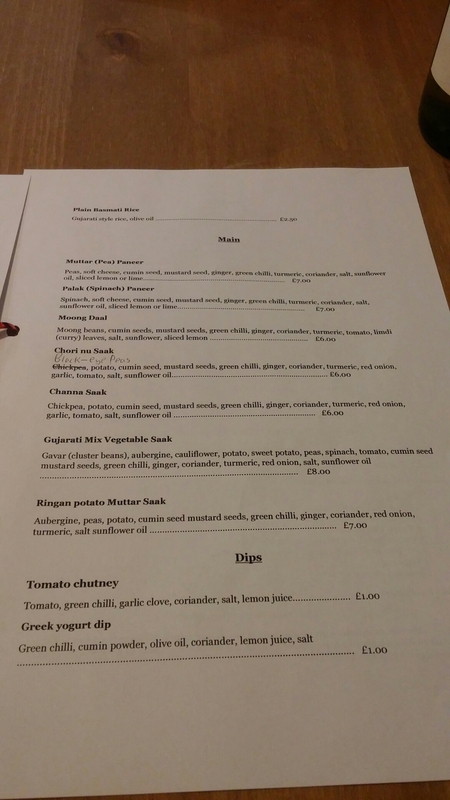 Happy people in my experience tend to produce nice things, so based on Mangla’s happiness index seemingly being off the scale the place certainly held the promise of a good meal. An enticing façade draws you in and inside it is rather quaint with a real hotch potch of tables and chairs. I love the open kitchen as I always enjoy watching a kitchen at work. Watching Mangla go about her business at a million miles an hour was mesmerizing. She was a veritable blur in the kitchen. We arrived early doors, at 6pm, and were first in but it soon filled up with both people eating in and people picking up take aways. and a slightly curious thali option. I say curious as I asked if it was enough for two (with perhaps the addition of an extra dish or two), but was told it was really of a size suited for one. 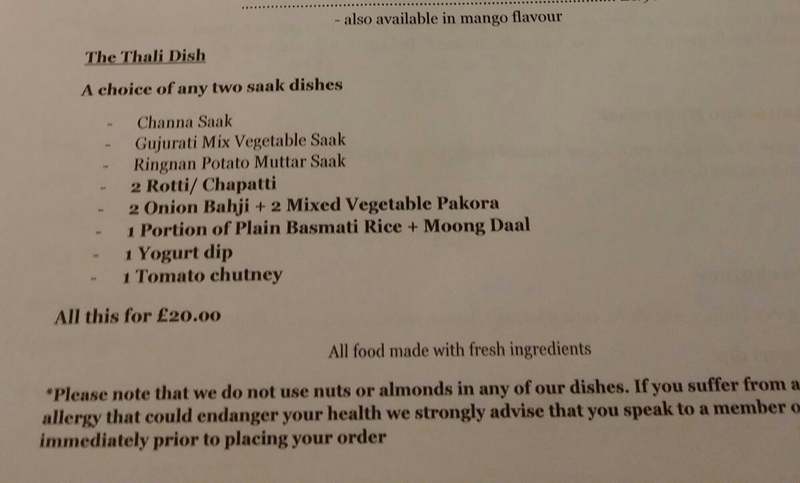 That is fine, but at £20 it seemed a bit pricey as against the meat and veggie thalis on offer at Chai Street (£9.95) and the veggie thali at the Vegetarian Food Studio (£6.95 + 10% service charge for eating it in). I suspect the one here is a lot bigger than those at the other two places, but why then say only really suitable for one person. We, as a result, passed on the thali and opted for a couple of starters followed by two curries, with 2 rotis and one portion of basmati rice. 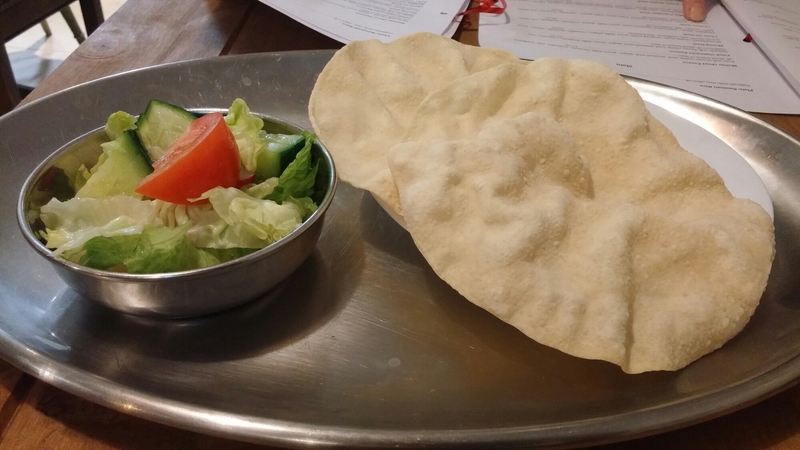 Whilst we were deciding on what to order a nice touch was the placing on the table, gratis, of a couple of crisp , oil free, poppadoms and a small bowl of salad (not, unfortunately dressed in any way – just needed a touch of oil and vinegar). 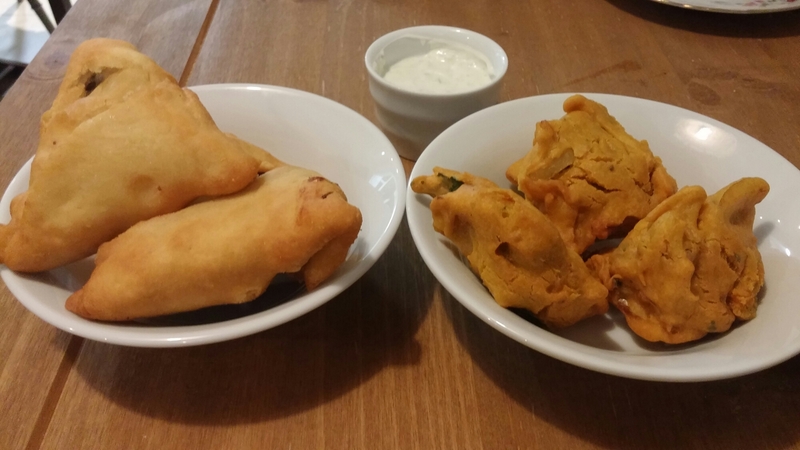 For starter we had the mixed veggie pakoras (£4 for three) and veggie samosas (£4 for two). Both had a very rustic, homemade look to them, but were delicious. A surprisingly light (bearing in mind the rustic look) encasement, with a well cooked and nicely spiced interior of mixed veggies in both cases. Very enjoyable and lovely with the (again nicely spiced) Greek yogurt dip (£1). Neither was pre-cooked. I know as I watched (from my rather good vantage point) Mangla roll out, fill and then fry our samosas and make and deep fry our pakoras. Both were nicely spiced, with lovely flavours. My favourite was the palek paneer, which had a pleasant creaminess to it and was heady with spice rather than heat. Mrs.SF on the other hand favoured the channa saak, with perfectly cooked potato and chick pea. Both can be vile, if overcooked and mushy or if undercooked and bullet like in texture, but here they were cooked bang on the money. Again the spicing was just right. These are curries with delicate and careful spicing rather than chilli afterburner heat. Mangla applies a deft hand with her spicing of curries here. To much and it would overpower the main ingredients and too little would risk a bland dish. The spicing of our curries resulted in maximum flavour from the minimal core ingredients. 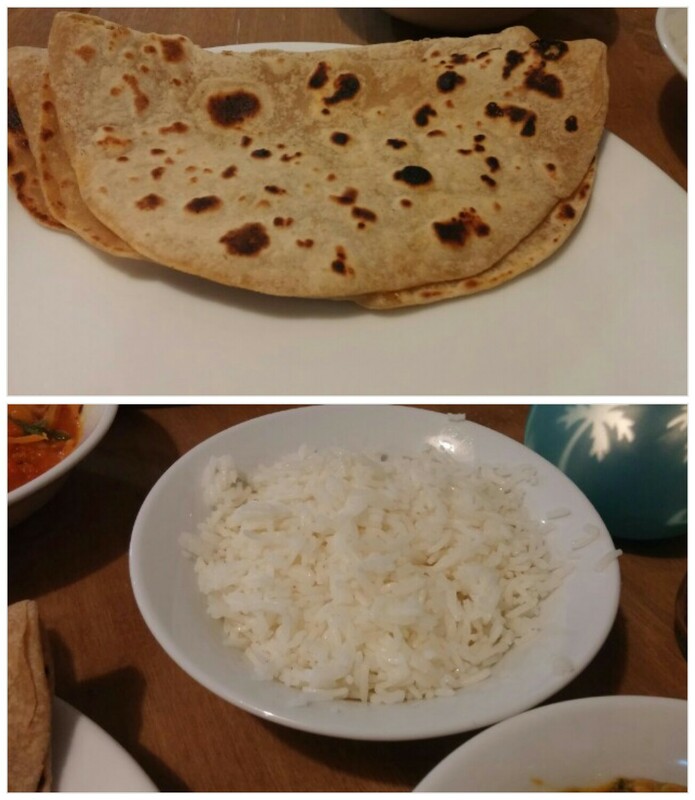 To accompany our curries, we ordered two rotis and one portion of basmati rice. The rotis, hand rolled and cooked to order, acted as very good vehicles in terms of transporting curry from plate to gob. My only slight qualm was they could perhaps have done with just a tad extra cooking time (they were just a bit under on the bottom side). One other thing we (particularly Mrs. SF) liked very much was the fact that the plates were all nicely hot. Far too many places serve food on stone cold plates, but not so here with the plates properly hot. There was a solitary dessert on the menu in the form of “gulab jamum”, which wasn’t available on the night. Not a huge fan of this, so not too perturbed it wasn’t available (odd it was off the menu so early in the night mind – I have a suspicion they were full on with other orders at the time rather than not having it). 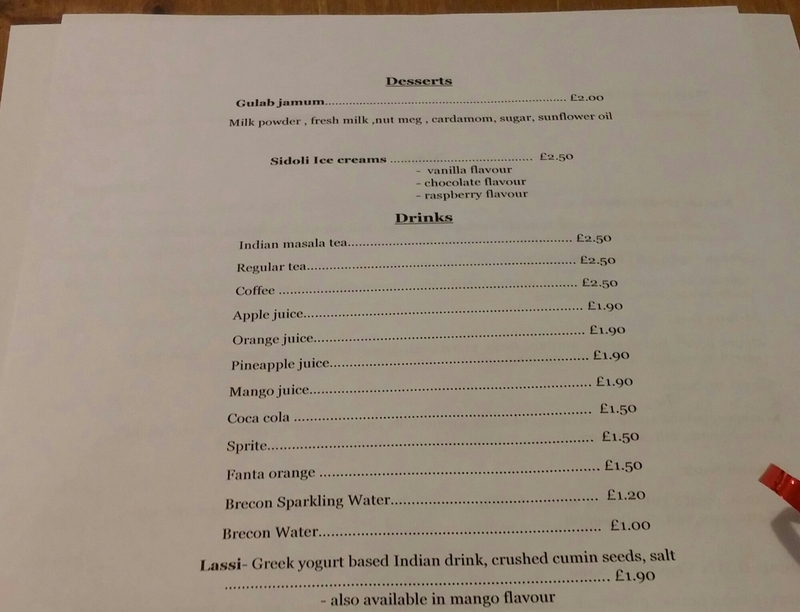 The place has no licence, so the drinks offering is fairly limited with lassi looking the best bet. They do, however, have a BYO policy (£3 corkage – I believe – I checked when I rang to book) which I always like. Spicy food can be tricky to pair wine wise, but robust rosés, rieslings (especially off dry ones – sweet works with heat) and gruner veltliners all work well, as do viogniers and pinot gris wines. 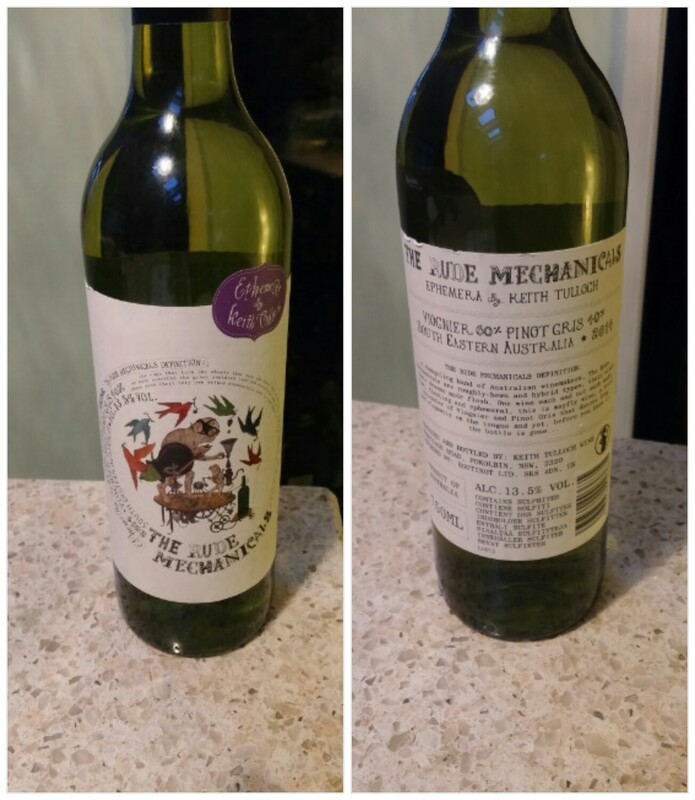 Based on the latter two, I picked an aussie number which was a blend of the two grapes (60% viognier and 40% pinot gris) in the form of a wine called “The Rude Mechanicals Ephremera” by Keith Tullock (retails at around the £9.95 mark) from New South Wales. Lovely wine this, which paired really well with the spicing of the dishes we ordered. Floral notes (honeysuckle) from the viognier and spice (ginger) and ripe pear from the pinot gris worked nicely with the spicing in all the dishes and this wine would, I think, work well with all but the spiciest of curries. 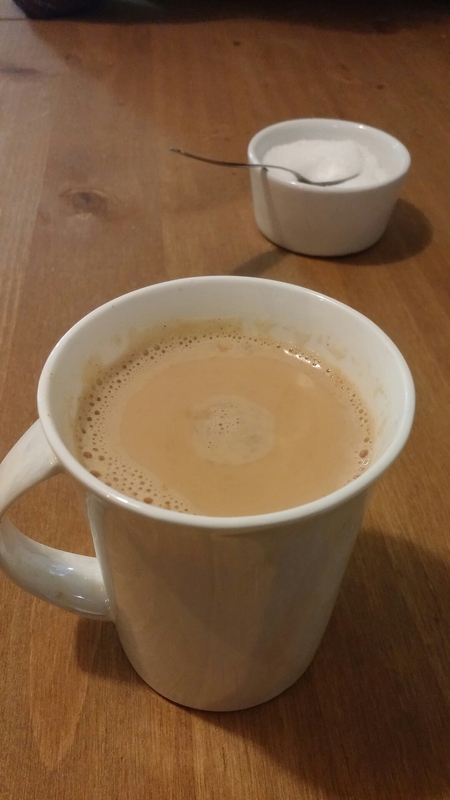 With no desserts on offer, we finished off the meal with some Indian marsala tea (£2.50). Very nicely flavoured, but needed a teaspoon and a half of sugar for my tastes. Odd that, as usually hate sugar in tea, but this definitely benefited from being sweetened. Both Mrs. SF and I really enjoyed our meal at this place. 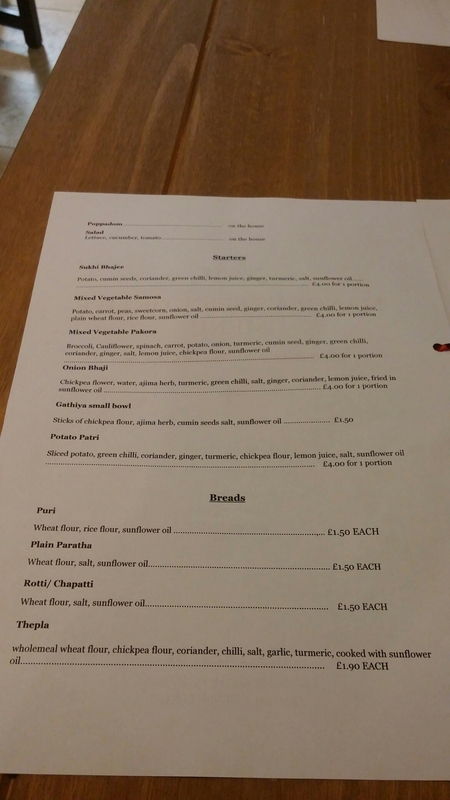 The food was lovely and all in at just over £32 (without the corkage) for the two of us was good value for the quality and quantity of what we got. Mrs. SF was very skeptical about going (took some persuasion from me to get her to agree to go), but came out a total convert and raving about how good the food was. 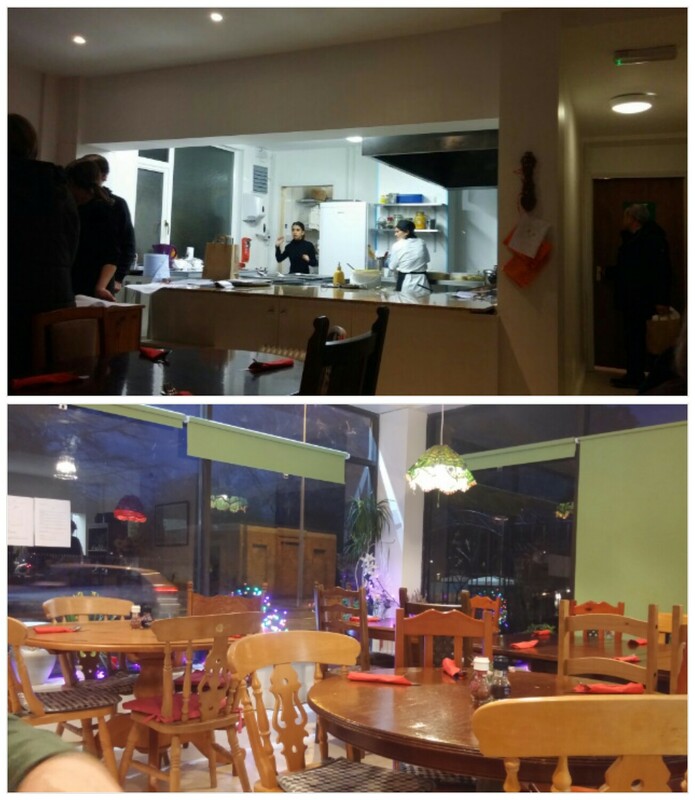 Service was a touch on the inexperienced side (with not a huge amount of knowledge regarding food on offer), but it was pleasant and well-meaning. Deserving of a tip (given) and I am sure they will grow into the role. Mangla came out and had a chat with us after our meal (as she seemed to do with all the dinners) and her joy at what she does was plain to see (and rather lovely). Would I go back? Yes – both for eat in and take away. Lovely little place that really deserves to succeed. No social media or online presence, as far as I am aware. Something they should perhaps rectify sooner rather than later. 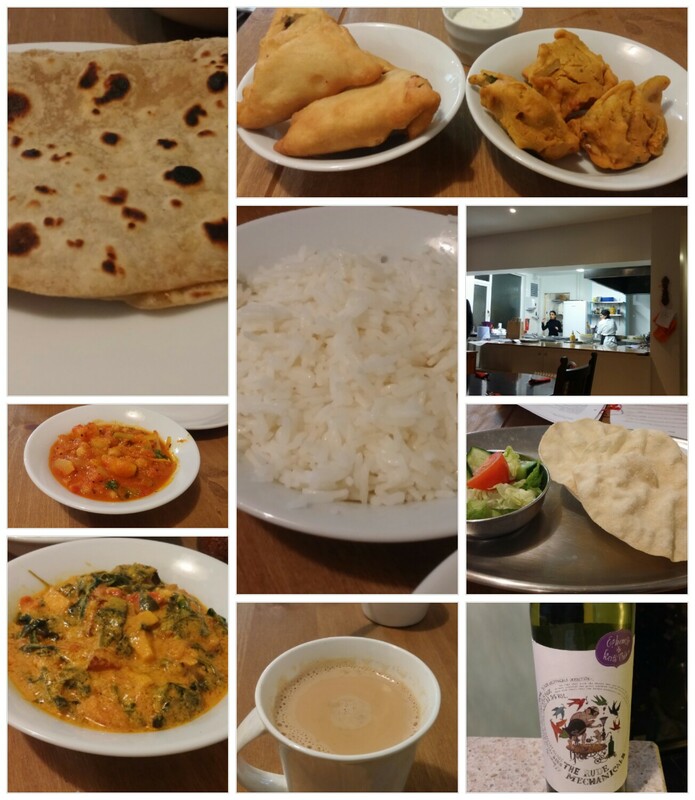 This entry was posted on Feb 26, 2017 by solicitingflavours in Alcoholic drink, Australian wine, BYO, Cardiff, Cardiff restaurant, cheese, corkage, Curry, Drink, Dry white wine, Food, Food and wine products, Gujarat, Gujarati food, Indian, New restaurant Cardiff, Non alcoholic drink, pinot gris, Restaurant Review, review, Rosé, Take away, Takeaway, Tea, Uncategorized, vegetarian food, viognier, Wales, White wine, wine, wine pairing, wine pairings.